The central rooms on the second floor of the museum give place to the permanent exhibition of twentieth-century art which presents the most decisive artists and endeavours from the period between the turn of the century and the end of World War II. In the section concentrating on art between 1896 and 1945, about 150 paintings, 30 sculptures and 200 medals are on display. In this assemblage, visitors may get acquainted with stylistic focuses slightly different from that of the previous exhibitions, along with thematic units and ouvre-preferences based on new aspects. 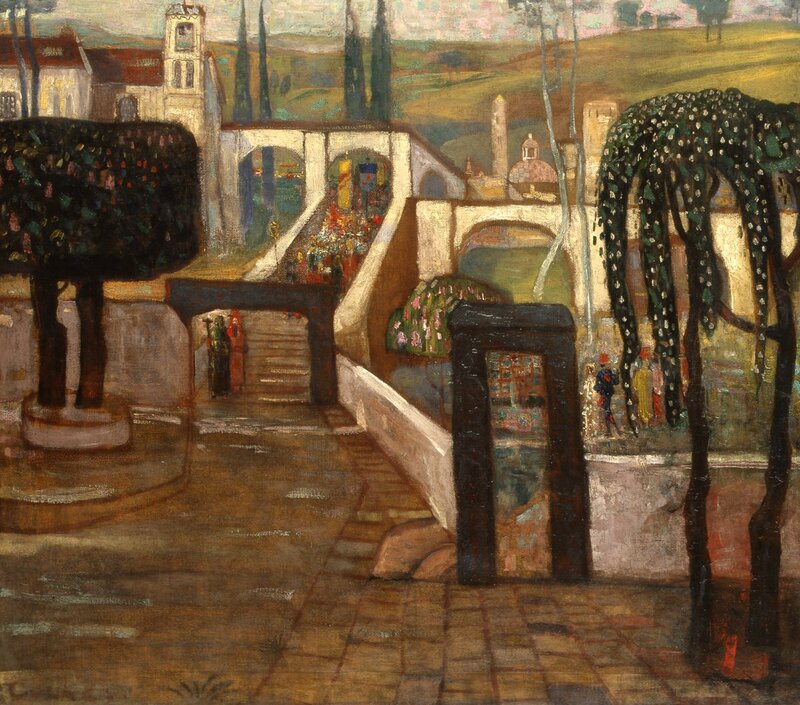 From the works of artists associated with symbolism and art nouveau, Lajos Gulácsy’s painting Magic (Garden of the Magician) is an outstanding one. 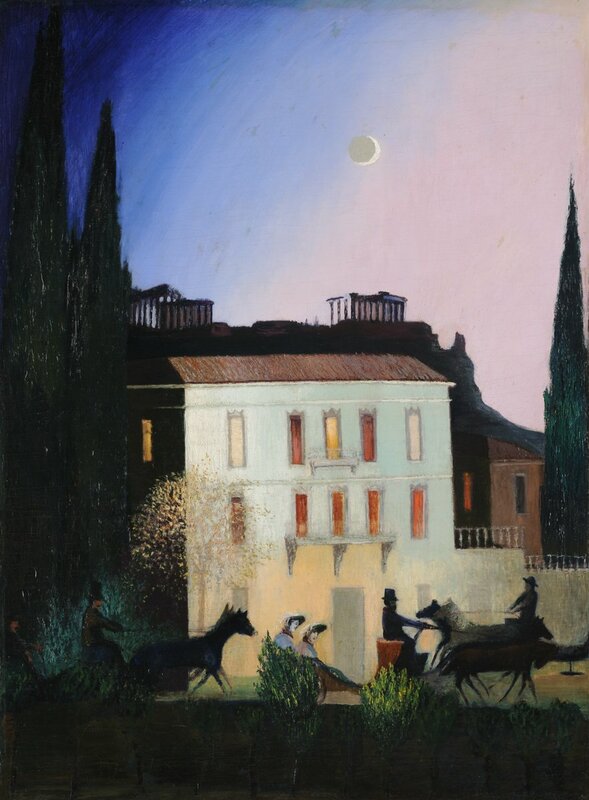 The most prominent works by the Hungarian Fauves, the group called Eight (Béla Czóbel, Dezső Czigány, Bertalan Pór, Károly Kernstok among others) and the avant-garde (József Nemes Lampérth, Béla Uitz, Sándor Bortnyik, Lajos Tihanyi) are followed by the section displaying the tendencies of the interwar period through the art of Lajos Vajda and Imre Ámos. Along with masterpieces made at the Nagybánya Artists’ Colony (today Baia Mare, Romania), mainly the paintings of Károly Ferenczy, and the art of József Rippl-Rónai, works by the members of the Artists’ New Society (Képzőművészek Új Társasága; such as Róbert Berény and Ödön Márffy) and the Gresham Circle (István Szőnyi, Aurél Bernáth, József Egry, Pál Pátzay) are also included. Next to the selection of paintings, sculptures and medals, art works lent by the Museum of Applied Arts are also exhibited. 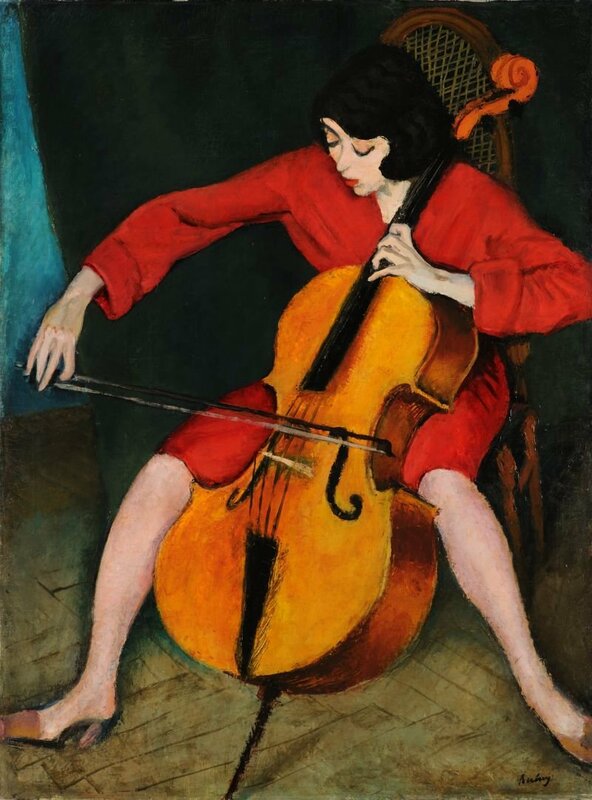 These are masterpieces of the turn of the century and the Bauhaus, mainly of periods in which artists worked in the spirit of the “Gesamstkunstwerk” and tried their skills in various genres: painting, pottery, furniture and tapestry design. In the rooms evoking original interiors, arranged according to contemporary and archive photographs, furniture decorated with folkloristic motifs by Ede Toroczkai Wigand from the Gödöllő Artists’ Colony, luxuriant art nouveau pottery from the Zsolnay Factory designed by József Rippl-Rónai for the Andrássy dining room and Marcel Breuer’s world-famous tubular furniture are displayed. One of the most impressive new features of the exhibition is the room Artistic Harmony inside a Bourgeois Home – Schiffer Mansion. The home of the successful contractor and patron Miksa Schiffer, designed by renowned architect József Vágó and finished in 1911, embodied the era’s modernist endeavours. The mansion, heavily damaged in World War II, is evoked by the panels by József Rippl-Rónai and István Csók, as well as Károly Kernstok’s design for a stained glass window and the fountain figures by Vilmos Fémes Beck. An emblematic masterpiece of the Hungarian Art Nouevau, the Golden Age had its public debut in 1898 at the Műcsarnok, where it won the grand prix of the Hungarian Fine Arts Society. It was later awarded the bronze medal at the 1900 Paris Exposition. The picture’s style is akin to the symbolism of Jugendstil melded with naturalism; its special atmosphere and refined sensuality are created by the duality between forms linked to the academic tradition and the use of decorativity that provides their counterpoint. Bortnyik’s composition with six figures conveys the Cubo-futuristic zeitgeist of dynamic movement and energetic struggle. The mutually confronting, rhythmically repeated rectangular forms and belligerent figures abstracted into machine-men exude the aggression that characterises destruction and the denial of the past. The solid texture of the oil paint thickly applied on the canvas base serves the purpose of the artistic representation of the material presence of physical power. During the more than ten years József Rippl-Rónai lived in France as a painter, he became familiar with the synthetic and decorative idiom that followed Impressionism. 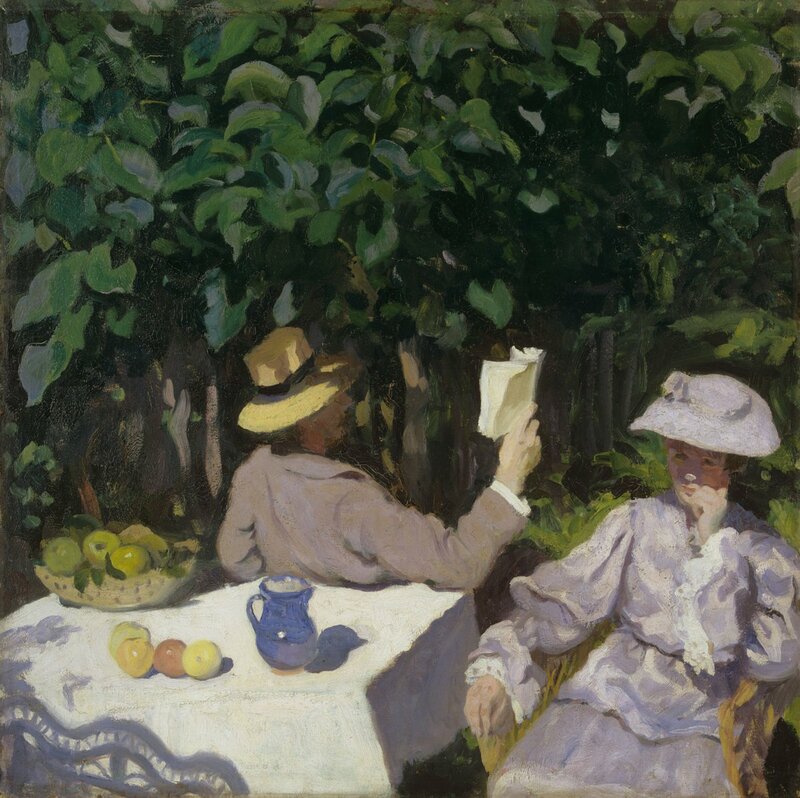 The artist returned home to Hungary in the early 1900s and settled in Kaposvár. The interior paintings he made there allow an insight into the loving atmosphere of small town life. In regard to its theme, this picture of his father and an old relative, referred to as Uncle Piacsek, is akin to the artist’s interior pictures.